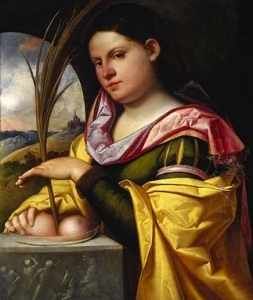 Born in Catania, Agatha was a young, beautiful and wealthy Christian girl. 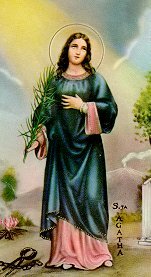 Unfortunately, her beauty caught the eye of Quinctianus (or Quintain), a magistrate that actively and brutally persecuted Christians. When she refused Quinctianus, she was sent to a brothel and was beaten. Failing to the corrupt Agatha, Quinctianus turned in anger to torture. That horrific torture included the amputation of her breasts without the aide of any medication or bandage to dress the wounds. 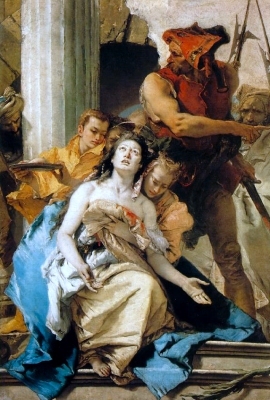 It is said that Saint Peter appeared to Agatha in a vision and dressed her wounds, helping her survive. When all of Quinctianus' attempts to break Agatha's spirit and faith failed, she was stretched out on a rack and thrown onto glowing coal ambers. During this torture of fire, there was a violent earthquake; her torturers took this s a sign and they promptly ran away. Surviving even this torture, Agatha was returned to her cell where she finally died with a prayer on her lips.